There are undoubtedly a number of intrinsic dangers present when riding a motorcycle, namely, other careless and negligent motorists. Yet, while many times other drivers are the root cause of motorcycle accidents that result in serious injuries or wrongful deaths, there are other risks motorcyclists frequently encounter. One particularly common cause of motorcycle accidents, other than negligent drivers, is hazardous road conditions. There are numerous hazards on the roads, including dangerous or unexpected curves, wet leaves, poorly designed ways, loose debris, potholes, improper or insufficient signage, fallen tree limbs, tire shreds, and other obstructions. In short, there are countless instances where roads that should be safe to ride on are suddenly perilous to motorcyclists. The experienced Boston motorcycle accident lawyers have many years successfully obtaining compensation for injured and wrongfully killed motorcyclists and their families. We understand the many nuances involved in each unique case and know insurance companies and their tactics. Call our Boston, Cambridge or Quincy office today for a FREE consultation to discuss your rights. Roads must be properly maintained and marked by the state and cities/towns in Massachusetts. If roads are left to degenerate into a poor condition, potholes are left untreated, dangerous curves are not clearly or correctly marked with paint and/or signs, the road is filled with uncollected debris or tree limbs, etc. 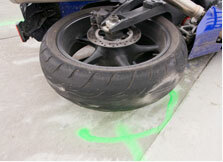 the state or municipality may be considered negligent and liable for your motorcycle accident. It is no secret that motorcyclists risk severe injuries such as broken bones, disfigurement, traumatic brain injuries, and death, where the cost of medical care and rehabilitation can be staggering, lost wages can pile up, and the pain and suffering is unimaginable. Victims and their families may be able to sue the state or municipality if their improper maintenance and recover their damages. If there is a dangerous obstruction or debris that comes loose or falls off another car or truck and strikes your motorcycle or causes you to lose control, that driver and/or a parent company should be held liable for your damages. In particular, if a truck or car is carrying an improperly secured load that causes your motorcycle accident, the driver, and perhaps a parent company through a respondeat superior claim, should be held at-fault. The Boston motorcycle accident attorneys at Bellotti Law Group, P.C. refuse to let any at-fault, negligent party get away without paying for the damages they have caused. Our Boston motorcycle accident attorneys at Bellotti Law Group, P.C. have earned reputations as being the most thorough and skilled personal injury lawyers in and around the Boston area. We have expert knowledge of the law, launch a thorough investigation surrounding your case, practice skilled negotiation with insurance companies to get you full and fair compensation, and are always meticulously prepared to fight for you in court if necessary. Call our Boston, Quincy, or Cambridge location today at 617-225-2100 for a free consultation. You can also use our safe and secure contact form and we will get back to you immediately.